Three very different artists with a shared passion for creating beautiful artworks, express their perspectives on art, travel and their environments. Stephanie Macfarlane is an award winning painter, whose inspiration comes from her travels in Europe, Morocco and New Zealand, as well as her more immediate environments of The Hunter and Sydney. Her paintings explore the urban world from village to city, fortress to medina, old to new, from real to imagined. Colour is an important element in Stephanie’s paintings as she revises our perceptions and transforms what the eye sees. Suzanne Reid works in a range of media. She has a love of making, sharing, teaching and learning about art and its therapeutic powers to enrich our lives. In this exhibition, Suzanne combines colour and humour in creating ceramics and painted fabric, with the aim of injecting whimsy and fun into the domestic environment. Suzanne has a strong belief that we can alter our perspective on life by altering our environment. Jane Smith has always loved colour, mosaic, abundance and decoration. Jane draws inspiration from extensive travels to Morocco, Spain and Japan where the beauty of nature is expressed in her favourite decorated tiles. Jane’s beautiful, original tile works are designed to enhance daily life, adding rich colour and form to any space. Jane’s long standing art practice includes a mosaic studio, teaching and sharing her skills with children and community projects. 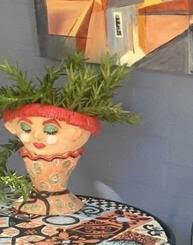 Jane has designed and created customised ceramic murals in many local buildings.